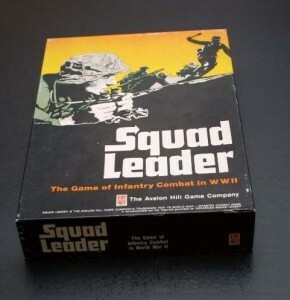 Squad Leader was a hex-based counter game, so keep that in mind. The Rally Phase was where you made repair and morale rolls. The Prep-Fire Phase was where the current player would fire any units that weren't moving that turn. 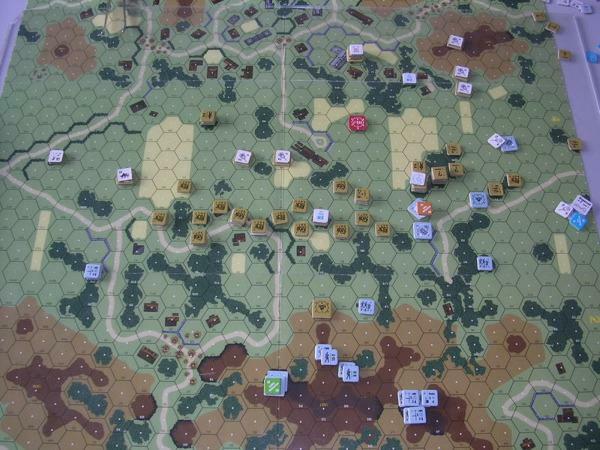 The Movement Phase was where the current player would move his units. The Defensive Fire Phase was where the opponent would get to fire on any units that just moved. There are no restrictions on who can fire (except for broken units), and they get bonuses to hit units which moved. The Advancing Fire Phase was where moving units could fire. The Rout Phase was where broken units (from both sides) would flee into cover. The Advance Phase let the current player move every counter one hex. The Close-Combat phase is self-explanatory. Ok, so right off, we don't need the Advance Phase (because we're not a Hex game, and it would be slow/pointless). Having Movement come after static firing leads to the commitment problem that we've discussed before. Because you can decide after you shoot whether to move anyone or not. We want players to commit to a course of action and be invested in the possible consequences. The Rally Phase and Defensive Fire can be rolled into a 'Reaction Phase', as we have now. While the Rout Phase can be rolled into Movement (as now). While we'll bring in our existing Starting Phase, and rename 'Prep Fire Phase' to 'Shooting Phase'. Fire Units that didn't move or Go To Ground. Opponent Gets Defensive Fire with all units not suppressed, GtG, or running. So looking at it in detail, we'd be adding one phase after the reaction phase, where units moving do their shooting. Which is what I'm most interested in. Letting the opponent shoot moving units before they can shoot back. We COULD do Move - React - Shoot - CC, but I think that putting CC right after moving and reactions feels more right, especially since we're going with the FoW idea that CCs are rare but decisive." I don't think that Move->React->CC->Shooting would work, unless we have static shooting rolled into that movement phase. Which differs only semantically from my outline above. Maybe we could move CC before Advancing Fire. But that would prevent advancing units from being able to suppress the unit they're trying to get into CC with. Which I don't think we really want. Once possibility does come to mind though, if we adopted a version of your second suggestion. This version would sandwich Close-Combat between the Reaction Phase, and the Advancing Fire Phase. Which would, in theory, allow us to switch to a melee-only Close-Combat Phase, while still allowing models in the combat to fire at each other during the Reaction and Advancing Fire phases. Defender rolls Ld/Suppression tests for ALL their units, even those in close-combat. If failed, defending units in CC must fall back (distance depends on % remaining models, as now). If passed, defending units in CC may shoot, but only at other units in the CC. Attacker consolidates his CC models (if not suppressed). Defender consolidates their CC models (if not suppressed). Melee attacks are performed back-and-forth until no engaged models are left. We could go with one back & forth round of Melee per turn, but I'd still like CC to be very decisive. So we melee until we can't anymore. Leaving only the surviving unengaged models when its over. Attacker rolls Ld/Suppression tests for ALL their units, even those in close-combat. If failed, attacking units in CC must fall back (distance depends on % remaining models). If passed, attacking units in CC may shoot, but only at other units in the CC. If an attacking unit won the combat, it gets a free consolidation move. First, it would pull all the shooting out of the CC Phase, and lower the overall complexity of it. Which would probably speed it up quite a bit, since you wouldn't be moving/shooting each melee round. Shooting would never have to worry about engaged/unengaged models, or tracking who moved, as there won't ever be any engaged models during shooting. Close-Combat/Melee would still be far more bloody and decisive than 40K, but would make more sense chronologically. In terms of what could reasonably happen in a turn. Models won't be firing or moving 2-5x more than they normally could just because the combat wears on. Preventing a number of CC problems that have cropped up in testing. Close-Combat can span multiple turns, but melee would not. We would be rolling Ld/Suppression, and removing markers, the same way for everyone. Whether they're in CC or not. Being suppressed wouldn't keep you from fighting, but it would stop you from consolidating into combat. Handing the initiative to your opponent, or causing both sides to just sit and shoot at each other. Makes supporting fire possible from other units outside the combat. But I'd probably limit that so that CC targets would have to be clearly visible (within Awareness & no hard cover) to the firing unit. Victorious attacking units would have a chance to get into cover before the Defender's next turn starts.